So, I can't remember if I updated you guys or not, but I got in to law school! And because I'm Type A and can't function without a plan, it's been killing me to have so much down time since I graduated in December. I have been in school my entire life, so I miss the business and the schedule of it and I'm feeling that excitement that comes before a new chapter, almost like starting college all over again! Every time I go to an event for accepted students, they tell me to relax and enjoy this break before law school starts, but that's just not gonna happen. 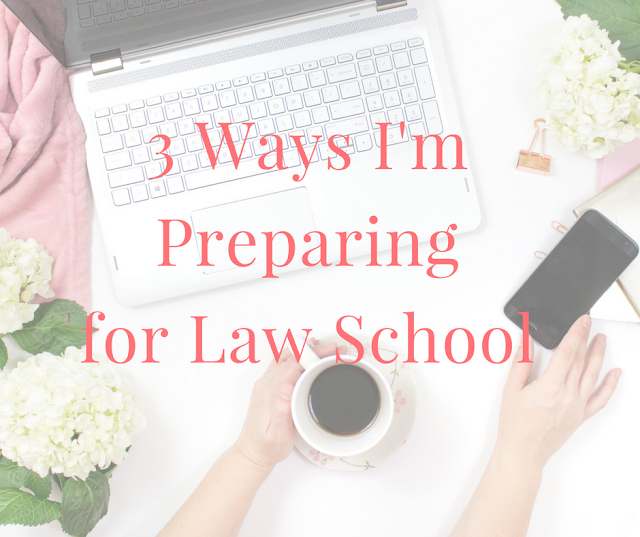 So if you're like me, I think you'll enjoy hearing about the ways I'm preparing and getting ready for my 1L year! 1 // School Supplies I know this sounds crazy, but I've been doing a lot of research on what supplies I should go into law school with. Not like pens and pencils, but like school bag/backpack, laptop, and planner wise. I know that to some people these may seem like small things, but for me those are 3 major parts of my productivity. As for laptop, I currently have a MacBook Pro from 2011, but everyone I've talked to has said to make sure that I get a newer one that has more memory and holds a longer charge, so that's my number one priority before school starts. My second one is the school bag I'm going to use, because I want something functional and light but a little more grown up than my current neon North Face backpack. I recently purchased a Longchamp Le Pliage tote in black and I love it. It's nylon, so it's super easy to clean and can handle light rain without getting soaked, plus it's magical and can fit everything without looking stuffed or getting too heavy. Because my textbooks can stay in my locker, and I plan to get a really light laptop, I'm not really worried about it being too heavy on my shoulder. All in all, I highly recommend it and it comes in TONS of colors. Lastly, I can't wait until May 17th to get another Simplified Planner. I love how simple and clean the SPs are, because they have all the room I need without all of those extra features that I don't. Plus, they're 12 month planners now, so no more wasting those 5 months every time 17 month planners overlap. Plus, the covers are precious and can now be monogrammed...it's the little things y'all. 2 // Leisure Reading Another tip that I've gotten from everyone is to do my leisure reading now, because once law school starts I won't have time to read anything but cases. I've been trying to read as much as possible, especially at night because my Law and Order SVU habit has been giving me nightmares! If you're starting law school in the fall and want to get some "fun" reading done over the summer, or just want a few book recommendations, start with my current reading list! 3 // Stocking Up One tip I hadn't heard but think is really helpful was to stock up on clothes, skincare, expensive makeup, etc while I'm still working, because you can't work your first year in law school. I'm stocking up on cute flats, a nice pair of jeans, tops I can wear with jeans of nice skirts, athletic wear, running shoes, etc. Any big tickets items that I won't have money for in the fall basically! I tried to think of things I wear day to day and make sure I have really good quality pieces that will last until I have a real job again! As long as you have business casual pieces that you can mix in with jeans and casual outfits you'll be good to go! I hope this helped a little if you're preparing for law school too! I know these things seem trivial, but for me, having these little bits figured out will help me handle the bigger things in the long run - like being broke and having way more work than I have time for. YAY!